Artificial intelligence, virtual reality, bioengineered foods and advances in robotic automation are regular topics of news headlines these days, but what do they mean for the Australian cattle industry? 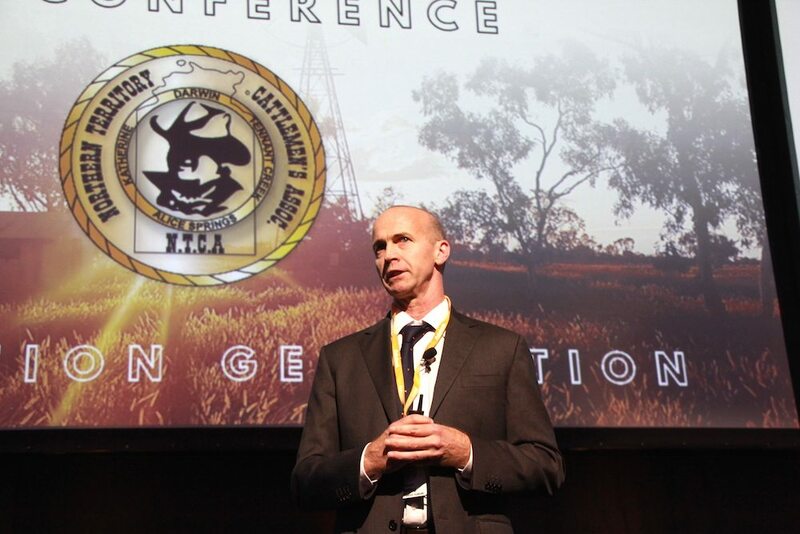 The 2018 Northern Territory Cattlemen’s Association conference promised to focus on innovation and delivered with a program of high level experts who helped to connect the dots on how technology already is, and will apparently only get faster at, reshaping out industry. Kaila Colbin (right) is the NZ and Australian ambassador for the Silicon Valley based Singularity University and the chair of the “Ministry of Awesome”. She offered some awe-inspiring, and perhaps slightly terrifying, insights as to just how far artificial intelligence has already progressed at the NTCA conference. The price performance of computing has been doubling every 18 months for the past century (starting with electro-mechanical punch cards). For $1000 today you can buy roughly the number of instructions per second that a mouse brain can process. Google executive Ray Kurzweil, who has a remarkable record of success at having predicted technological advancements since the 1980s, believes that in about five years from now, $1000 will buy you the number of instructions per second a human brain can process. And by 2049, $1000 will buy the number of instructions per second that all human brains on the planet combined can process. This doubling curve is what happens to any technology once it becomes ‘information enabled’, or powered by ‘ones and zeroes’. Think about photography, for example. For most of its history it was ‘substrate enabled’ technology, dependent upon physical film. But once it made the leap to digital and became dependent not on film but on ones and zeroes instead, what followed was a doubling curve in price performance. The first digital camera created in the 1970s had a resolution of .01 megapixel. Today you can buy a 41 megapixel camera as part of a smartphone. Other technologies that have become information-enabled and are following doubling curves are computing, artificial intelligence, robotics (including self-driving cars), biotechnology, nanotechnology, gene sequencing, neuroscience and energy. Many people often don’t notice these trends as they are emerging because these upward curves appear flat for a very long time. Think of a piece of paper that is folded in half over and over again. At first nothing much appears to happen, the increasing thickness of the folded paper is barely noticeable. But inevitably as the thickness of each fold doubles, an inflection point is reached where each further step becomes much more significant. Ms Colbin also pointed out that our brains are not wired to comprehend these non-linear progressions. Humans evolved on the Savannah chasing prey and running from predators that behaved in a predictable linear fashion. 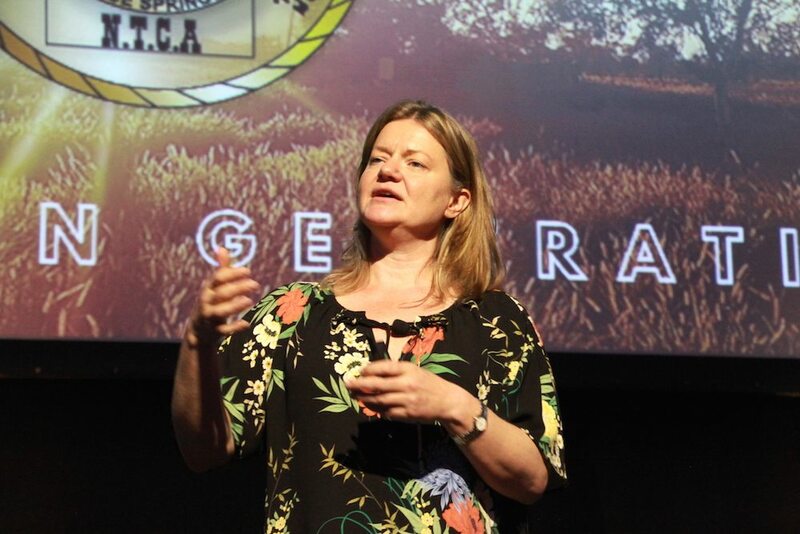 Her core message was that information-enabled technologies are continuing to double in progress, a phenomenon that will only accelerate and which will dramatically change our futures. For this reason, she said, it was also no longer possible to use the past to predict the future. Information-enabled technologies are also starting to converge. What happens when an exponential progression of Artificial Intelligence converges with an exponential progression in robotics? Or when biotechnology converges with 3D printing? Amazing breakthroughs, but potentially catastrophic disruptions to entire industries. The price of LED lighting has reduced by 90 percent in recent years, at the same time product lifespan has doubled. Why does this matter? It dramatically improves the viability of indoor farming, which relies heavily on artificial lighting. A massive indoor farm that already exists in Japan is said to be far more productive per square foot than a traditional farm, using 40pc less power and 99pc less water. The world’s largest indoor farm opened up in New Jersey in a disused paintball facility last year, and now supplies product to New York City grocery stores at price parity with organic produce from California. And, being indoors, it doesn’t have to worry about the weather. Bioengineered products like milk and eggs can now be produced in labs to standards that satisfy some of the word’s biggest industrial caterers and food manufacturers, who buy milk and eggs by the thousands of litres and thousands of kilograms. On every key metric including shelf life, certainty of supply, taste etc the bioengineered product wins, Ms Colbin said. The price performance of solar energy, another information-enabled form of technology, is improving exponentially. Linear technologies like coal and oil have gradually bumped along over time while gradually increasing in price. When solar first came into awareness it was so expensive it was not seen as useful. Since then the price has plummeted. One expert noted last year that it is now cheaper to build and operate a new solar plant than it is to maintain an existing coal plant, triggering a massive turning point in terms of the shift away from fossil fuels. As with solar, when this technology emerged it was ridiculously expensive – one kilogram of lab cultured ‘meat’ was worth an estimated $2.3 million. But, like solar, it is also an information-enabled technology that is following a doubling curve. A kilogram dropped in price to about $40,000, and then to around $80. Still expensive, but its price is expected to continue to come down dramatically. China recently signed a $300m deal to invest in three lab grown meat producers in Israel. Beyond Meat makes plant based burgers, supplying 5000 grocery stories and 6000 restaurants in the US, and last week announced it had sold its 11 millionth plant based burger. The world’s second biggest meat producer Tyson Foods has also stated that plant based protein is growing faster than animal based protein and it investing in the technology. 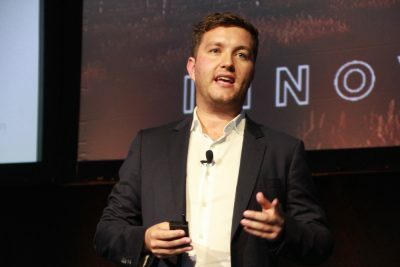 Meat & Livestock Australia’s Sean Starling also detailed some of the technology the producer levy-funded research, development and extension organisation is exploring specifically for Australia’s cattle industry. MLA is soon to take delivery of a prototype automated drone that will be tested on cattle properties throughout northern Australia. The US military has used similar automated drones in the Middle East for a range of activities including providing supplies to mobile platoons, allowing them to stay away from base for longer. MLA has engaged several northern cattle producers in helping to design the prototype it is having built. It will use a diesel electric motor, can carry a 500kg payload, and is designed to handle heat and the rugged conditions of Australia’s north. Mr Starling said a major focus of MLA’s research program is to develop aerial drones that within three to five years will be able to do more than simply check on watering points. If that can’t be achieved aerial drones as a platform are likely to be of limited value and future use for cattle producers, he said. In addition to the DEXA objective measurement system which can measure fat, bone and meat in carcases in processing plants, and the distribution of each, MLA is also working to develop objective measurement technology for eating quality and health of an animal, potentially for use in future in feedlots and on farms. Mr Starling said MLA had been fortunate to be able to partner with one of the world’s most reputable and largest aviation luggage CT scanning companies, which is investing $11 million to evolve its know how to apply its technology to the Australian livestock industry. The goal is to be able to scan to detect marbling content in a live animal, on farm or at feedlot induction. MLA has three high tech robotic scanning systems coming to Australia in 2019, and is also preparing a funding application for the board to consider which would involve a mobile scanning system to trial. Mr Starling said MLA is also working to understand on-farm connectivity issues for cattle and sheep producers, and to connect producers with experts and products that can provide solutions. MLA has also been developing a list of all of the various “Internet of Things” connected devices that are now available for farm-use in Australia, such as tags, water sensors, soil sensors, weather stations, for use by producers. “We need to keep working with our processing sector to get their costs down because the whole supply chain pays for it,” Mr Starling explained. Precision robotic processing supported by x-ray imagery was helping to ensure more meat from each carcase ends up as higher value primary cuts, which can in turn deliver substantially higher returns for a processor over a year. “It will take us another 5-10 years but we will see Australia really start to lead the way in beef boning automation,” Mr Starling said. David O’Mahony leads Google Australia’s small to medium business team in Sydney, and works with companies all over Australia every day helping them to improve their digital strategy and how to grow their online presence. Two thirds of the world’s population does not yet have internet access, Mr O’Mahony said. 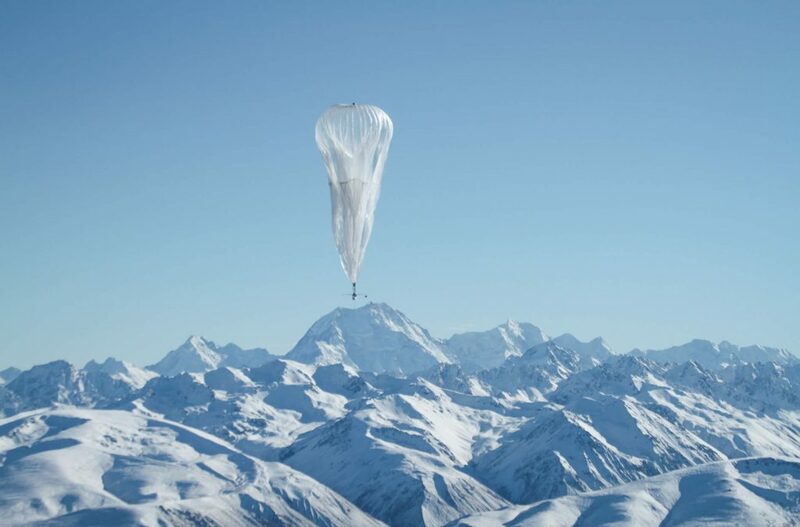 Through “Project Loon” Google is putting a network of balloons into the stratosphere, which are designed to connect people in rural and remote areas who don’t have access to internet to bridge coverage gaps and to bring people back online after disasters. Google has been working in recent years to help bring internet technology to clothing. Think for example of a cattle producer in a remote area wearing boots that could help track that person’s location if they got into trouble, or even whether they are walking or not. Another example is Google’s Project Jacquard – in which Google and Levi’s have produced a ‘conductive yarn’ (thin metallic alloys embedded into clothing fibres ) that allow a user to control their mobile phones by touching their jacket sleeve. 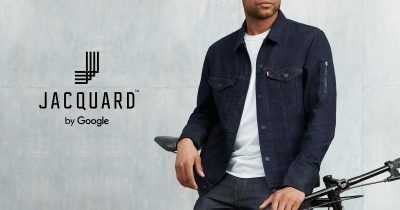 The initial design is aimed at cyclists, and providing a denim jacket that allows them to access music, maps, phone calls etc without having to pull their phone from their pocket. The technology is already here, Mr O’Mahony explained, and Google is working to see how it could be brought to life for the agricultural sector in Australia. With Project Wing, Google is building what it terms the next generation of delivery drones to efficiently dispatch everything from consumer goods to emergency medicine. It is also developing an unmanned airspace traffic management platform to enable its fleet of drones to safely share the sky with other operators. 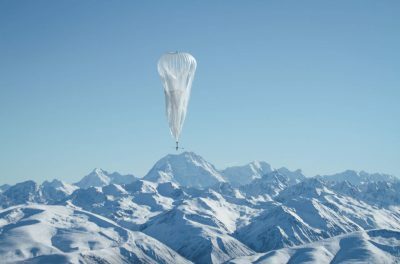 In effect Google says that with Project Wing it is building a new commerce system that “opens up universal access to the sky”. Attracting and retaining staff is a big challenge right across Australian agriculture. Mr O’Mahony noted that there are now some 20 million users on You Tube every single month in Australia, spending on average 20 hours a month on the site. One of the most popular categories of video is ‘how to’ videos. “So how are we telling the NT’s story when it comes to finding talent and attracting people to the farm?” he asked. “What about if someone is starting a role on farm, could we create a series of how to videos to help people understand what it is like in the role?” You Tube Red also meant videos could be downloaded and viewed offline for use in areas lacking connectivity to the internet. These days, we don’t just go online, we live on line. On average most people look at phones 150 times a day. Nine out of every 10 people, when they are looking for information go to their phone. 53 percent of all users will leave a site that takes 3 seconds to load. In US average site speed is 6 seconds. Australia that is still 12. “Companies who really invest in a good strong fast website, their consumers are happy and they keep coming back,” Mr O’Mahony said. “Also, think about the flow of the website. When someone comes to your website, why are they there, what are they looking for? Are we giving them the type of experience they are looking for?”. 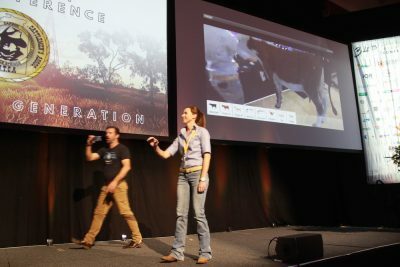 SwagBot was another technology of specific relevance to the Australian cattle industry which featured briefly at the NTCA conference. 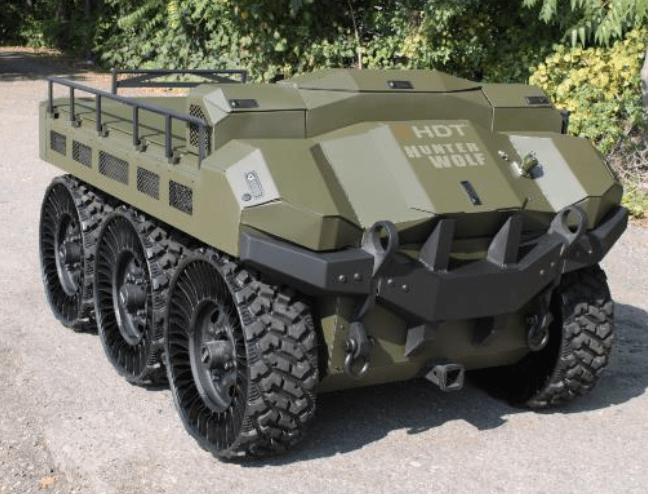 It is an omni-directional electric vehicle developed by the University of Sydney’s Australian Centre for Field Robotic for use on grazing livestock farms. It is designed to traverse a wide range of terrains and to live out in the paddock using cameras and sensors to gather information on livestock, soil and pasture health, and to potentially herd and move livestock and spray weeds. Designed to use solar powered recharge stations out in the field, and also potentially to act as a mobile recharging station for drones to increase their effective range. It is currently in development and some years from being commercialised. A few years ago Facebook ran a competition, in which it gave a way a bus. To enter applicants had to write in 25 words or less what they would do with the bus if they won it. IT expert Tim Gentle, the son of a dairy farmer from Victoria, was one of the entrants and said he’d convert it into a classroom and travel throughout the outback teaching people about the digital world. He and the bus have since been on a truly remarkable journey that has indeed helped to teach people in country communities, young and old, how the digital world can help them. It has visited Longreach, Swan Hill, Byron Bay, Mildura, many places in between and last week Mr Gentle was in Alice Springs. In an entertaining and enlightening presentation he walked the crowd at the NTCA 2018 conference in the use of 360 degree cameras, and the power of virtual reality to enable people far away to immerse themselves in the live or recorded vision. 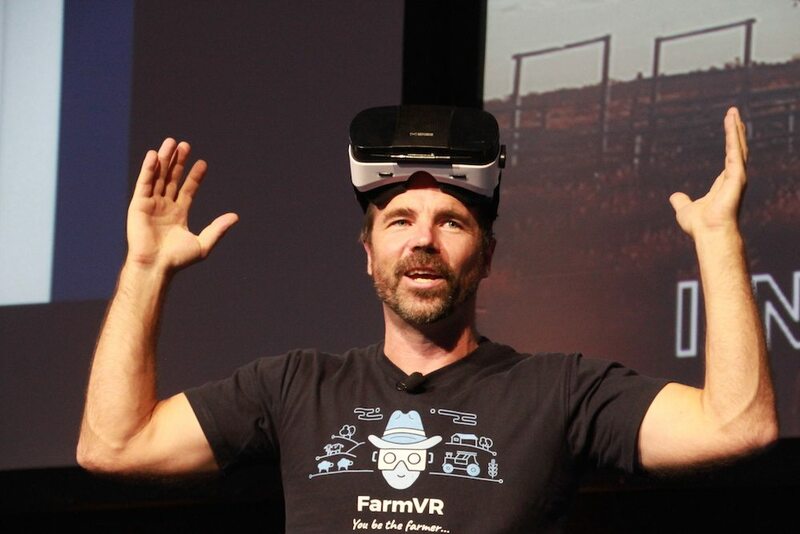 Mr Gentle said his ultimate vision for Farm VR is to see a farmer in one country use the technology to provide instruction to a farmer in another country who puts on a headset and watches the technique. An augmented reality demonstration putting an electronic cow on the stage at NTCA 2018. However he believes it will be ‘augmented reality’, not virtual reality, that will become the most useful tool of all. That is augmented reality, which uses headsets like glasses that allow people to see each other, but their vision through the glasses is also augmented with digital content. For example, a farmer working on a tractor could use a set of augmented reality glasses to guide them through the process. A cattle producer can use the CAD drawings of a new set of cattle yards to physically walk through the yards to see how they will work before they are built. but they were not quite sure the pathway of Cyclone Marcus or Cyclone Nora. Thanks. I think the term “artificial intelligence” is being misused. What makes us human is the ability to create something new. I think that is what people are misunderstanding. Most of what we do is based upon what we have learned in the past. A grazier buying a bull. He knows from past experience and knowledge what to look for. Down the track perhaps some electronic machine could be programmed to do this also, with much greater ability then the grazier as the machine will have vast knowledge resources at it’s instant disposal. A lawyer draws on past experience and knowledge to do their job. Those sorts of things will be able to be replicated by machines through programming. However humans can create music, paint, write novels and create things. Humans also dream. Do computers dream of electric sheep? Artificial Intelligence is when they move beyond programming. I think drones will be the next big thing in extensive agriculture production..
What an eye opener into the 4th Industrial Revolution. It certainly is challenging trying to get our heads around what our industry is going to look like in 5 years let alone when our kids are farmers!